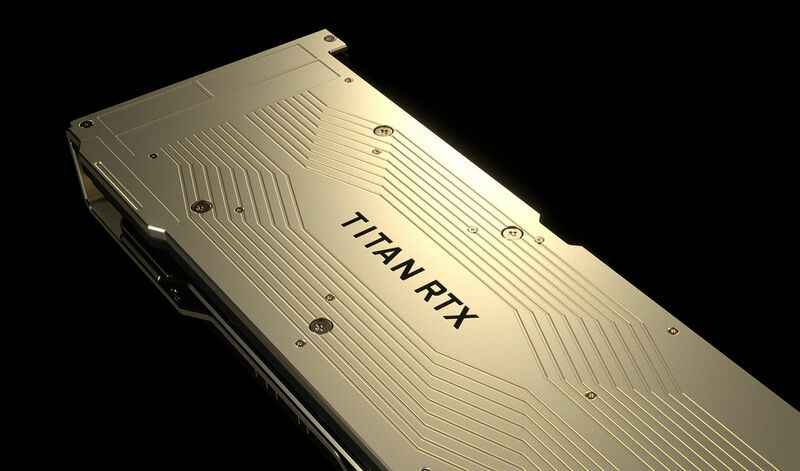 Shortly after teasing it, NVIDIA has officially unveiled the its top-end GPU, the Titan RTX. As expected, it has 72 Turing RT and 4,608 CUDA cores, up from 68 and 4,352, respectively, over the RTX 2080 Ti. However, this isn’t so much a consumer card (unlike last year’s Titan XP), but more in the family of the Titan V compute GPU. As such, it comes with a whopping 24GB of GDDR6 VRAM and packs a $2,500 price tag, both more than double that of the RTX 2080 Ti. The Titan RTX is aimed at AI researchers, workstation users and gamers with deep pockets. However, it strongly resembles the RTX 2080 Ti, albeit with a lot more memory. It’s also got full-fat TU102 GPU, much like NVIDIA’s $6,300 workstation-oriented Quadro RTX 6000, and has the same number of CUDA, Tensor and RT cores and identical 24GB of GDDR6 VRAM. With the last generation of GTX cards, NVIDIA had a consumer Titan XP card that cost $1,200, but it has shifted strategies since the Titan V. The Titan RTX is thus aimed more at AI researchers and other users who might want to take advantage of the tensor cores, which deliver real-time ray-traced graphics. The extra memory will also make it possible for scientists to run much larger simulations than you could with the RTX 2080 Ti’s 11GB of memory. Considering it matches the specs of the Quadro RTX 6000 card almost to a “T,” it might also be an interesting card for the 3D animation, motion graphics and video editing set. It costs less than half the price, and apart from graphics drivers and OpenGL (used in very few apps these days), should offer similar performance. All that said, raw gaming speeds should be 10 to 20 percent better than the RTX 2080 Ti. And unlike the $3,000 Titan V — which used pricey HBM2 memory and had an awkward relation to other GeForce cards — the Titan RTX closely resembles its gaming-oriented RTX siblings. So, expect this to be a card that will be purchased by certain types of gamers for whom the $1,200 RTX 2080 Ti just won’t do.